Step five: Now that the paintings are complete, Goldenberg used the magic marker tracing as a guide to tear the paintings to their final size. Carefully using a bone folder, thumb and forefinger, he carefully tore the painting about an inch inside of the marker line to created a delicate, translucent deckled edge. 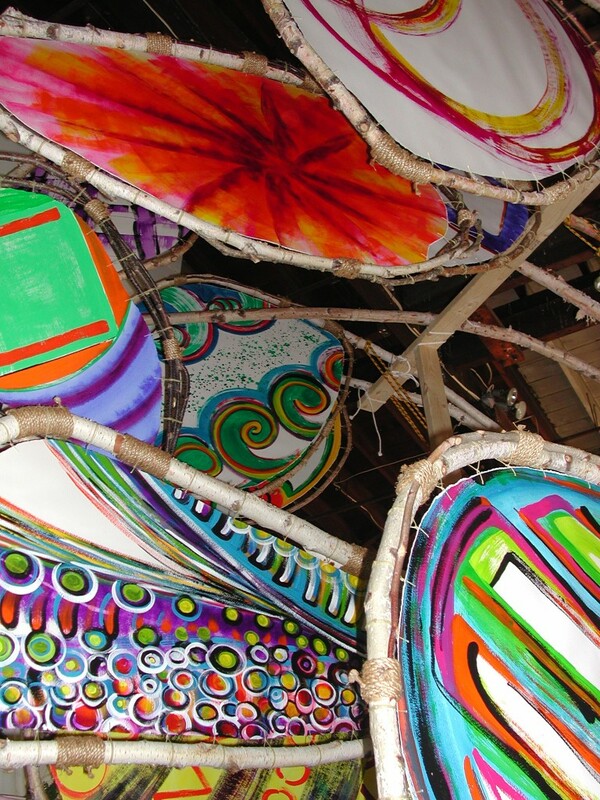 Now each painting and birch tree sculptural element had been catalogued with a number, letter and color swatch to indicate their appropriate pairings. 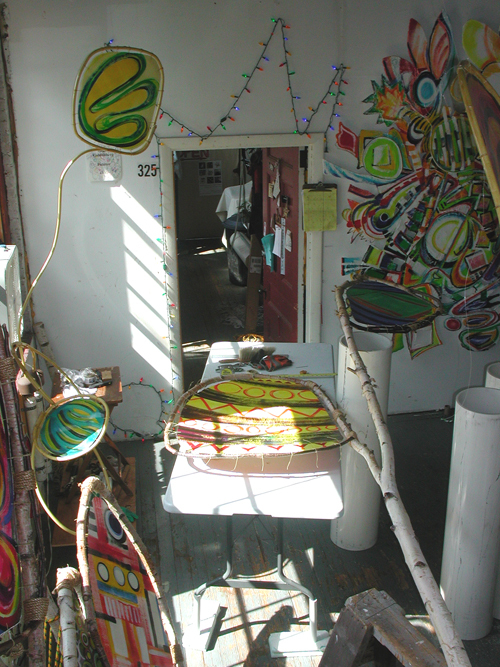 One by one, Roger set-up a sculptural element across sawhorses in the long hallway and began custom fitting each painting to their appropriate birch tree and began the delicate process of easing each painting permanently into place. Each painting was lashed with a multitude of .05mm waxed thread and thread tied with special slip-proof knot. 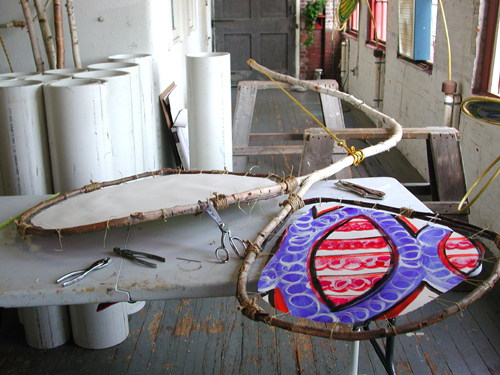 Pictured left and right are two examples of the finished paintings that have yet to be torn to size thereby creating a translucent deckled edge to finish the edge of each painting. 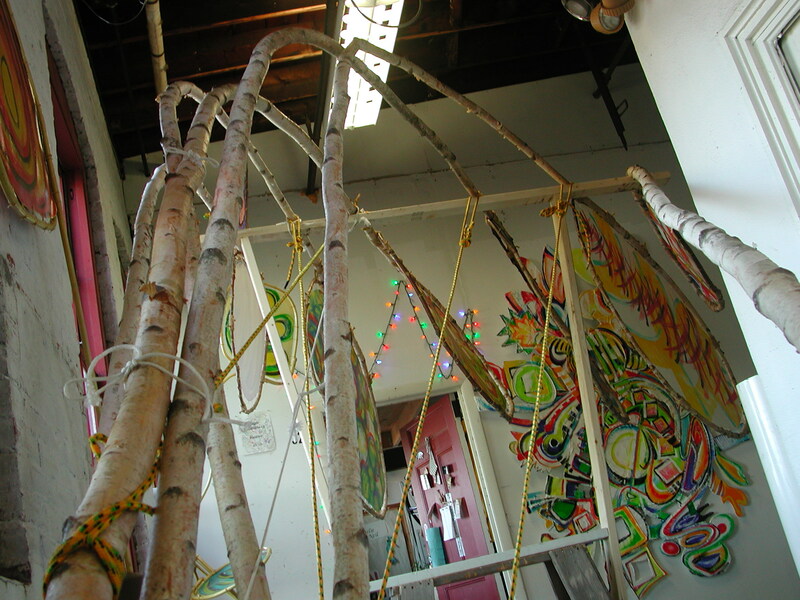 Above is one of the birch sculptural elements laid across the hallway work station. Roger used two saw horses to support the length and weight of the tree, while laying the bent end across a portable work table. 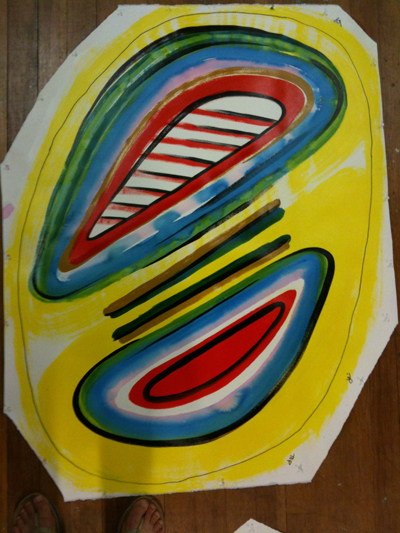 The curved elipses became the support structure and graceful frame for the individual paintings. 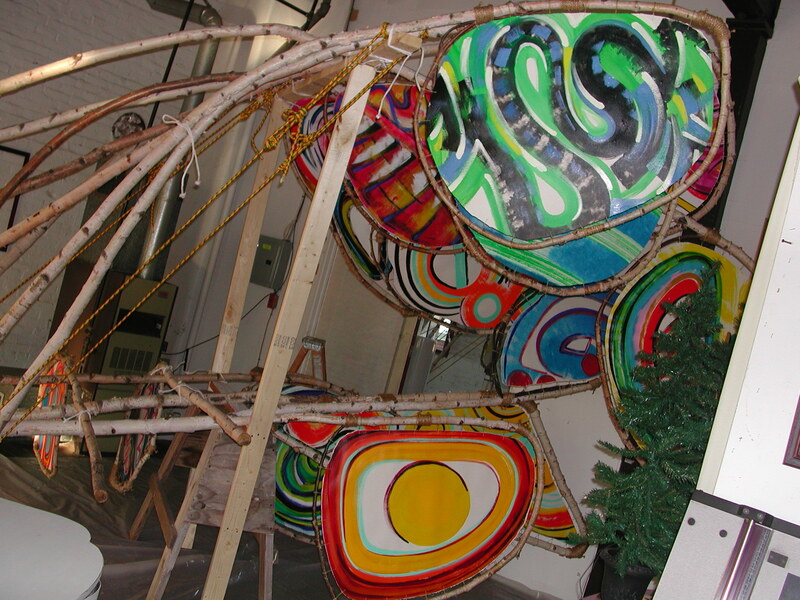 In the left edge of the image one can see the 4 foot long PVC pipes eight and 10 inches in diameter, that were prepared by Goldenberg to become the swivel bases for this kinetic sculpture. 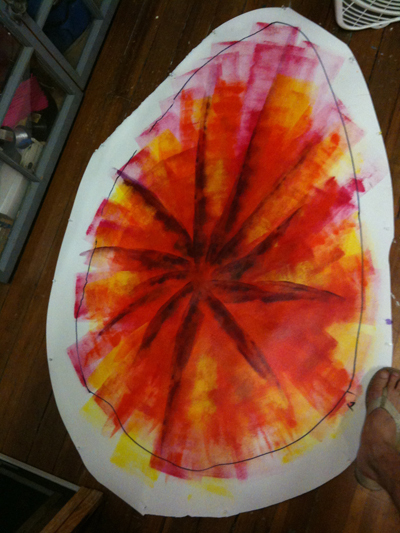 A couple more pictures of the fitting process for the paintings. 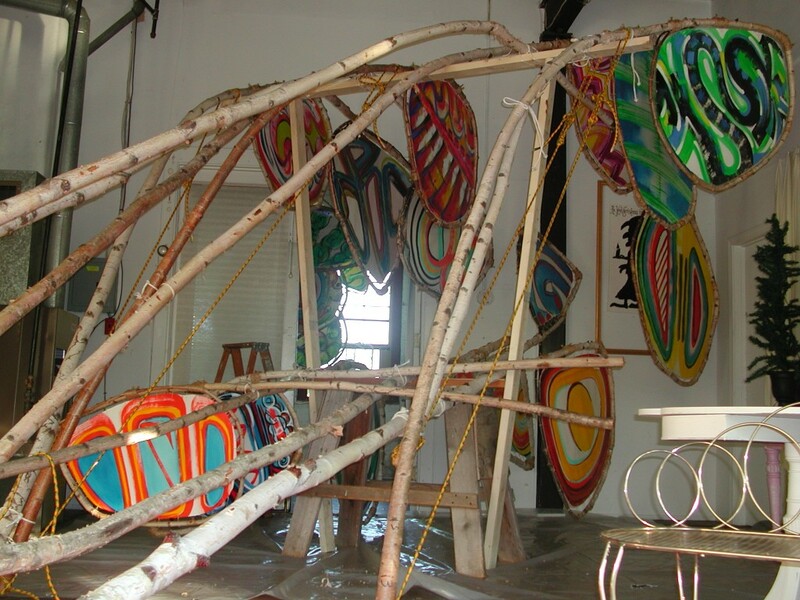 Step six: After three weeks the paintings had all been fastened to the birch ellipses and hundreds upon hundreds of knots had been tied. While tying knots Goldenberg had time to plan the next step–varnishing the paintings to complete the weatherproofing process. Roger devised a rack ‘n’ stack system that utilized the same old saw horses and some two by fours. He was able to set up this staging in the hallway and in Rita Fabbricatore’s studio. This sixth step involved hand painting each of the 42 paintings with five coats of varnish. By the penultimate coat, Roger enlisted the help of Beth Liguori. Her enthusiasm, moral support and skill made lighter work of this pains- taking task and energized Roger to put on a fifth and final coat for safe measure. 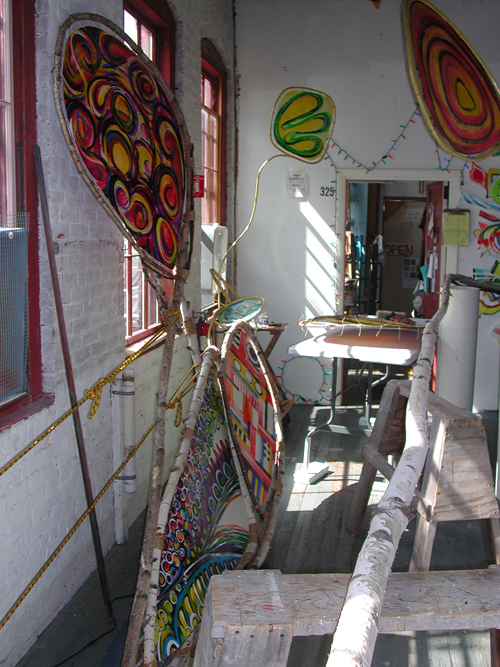 Here are a views of one of two varnishing stations. The birch tree sculptural elements areresting and fastened into place, ready to be coated with the special weather proofing varnish. A total of five coats were painstakingly applied,with careful attention paid to coating the threads, the apertures through which they penetrated the watercolor paper, and to every square centimeter of the paintings. 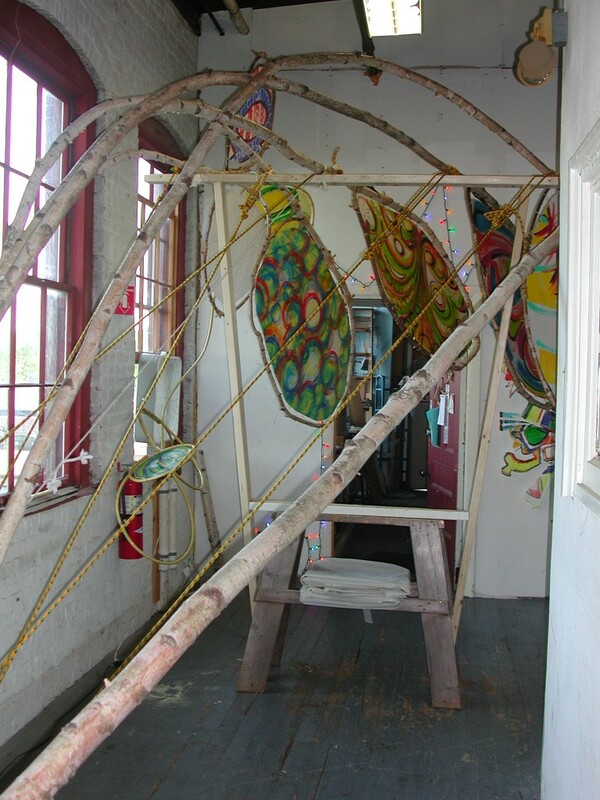 The second varnishing station that Goldenberg erected in his neighbor’s studio.